Protein 23%, Fat 30%, and Fiber 0.20% with Colostrum. An instant mixing, all milk protein, complete first feed for lambs. It provides the entire nutritional requirements of the baby lamb from it's second day of life through to weaning. Acidified to prevent bacterial spoilage once reconstituted giving mixed milk a shelf life of up to 24 hrs. Contains emulsified fats, supplemental vitamins, minerals, and trace elements. 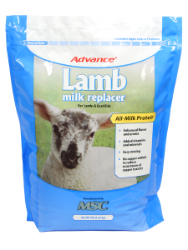 Formulated to meet all the nutritional requirements of the lamb and to allow maximum growth rates when fed ad-lib.